All transactions are safe and secure with a reliable history in online purchasing behind each of our associates. Buy the Sons of Arkham Joker t-shirt to own Batman clothing and merchandise. The character of the Joker, who first appeared in Batman #1 in the spring of 1940, was based on the Joker that is included in decks of playing cards. The comic's creators, Bob Kane and Bill Finger, revised the villain's appearance to resemble that of actor Conrad Veidt's character from the 1928 movie The Man Who Laughs. 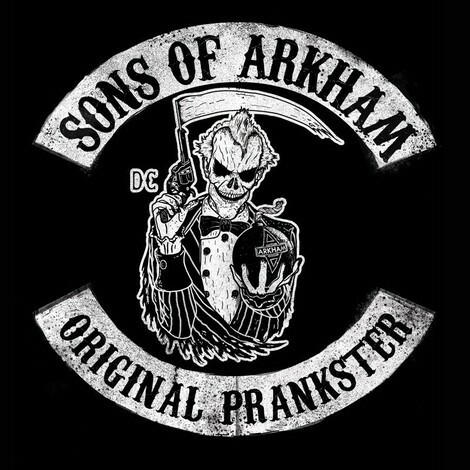 This Sons of Arkham Joker Batman t-shirt blends the Sons of Anarchy TV show logo with the Caped Crusader's archenemy. In addition to the Sons of Arkham Joker tee above, browse the Batman Clothing Gallery for more apparel like men's and women's clothes, kids shirts or hoodies.